Scientists have long known that pain’s intensity is difficult to measure because people experience pain differently. In the case of 17-year-old Sarah Taylor, doctors struggled to understand her levels of pain from childhood arthritis and fibromyalgia. Some scientists working with Taylor are now trying to develop an objective way to measure pain. They are measuring the reaction inside Taylor’s eyes when she reports pain and when she does not. Dr. Julia Finkel is with Children’s National Medical Center in Washington. She invented an experimental device that is being used with Taylor. Doctors have traditionally asked patients to rate their pain on a scale of one to 10. That can be a problem, however. Medical workers can estimate babies’ pain from their cries and movements. But the pain one person rates as seven, for example, might be four to someone who is more tolerant of pain. These differences make it difficult to show how well new medicines to ease pain really work. The question is especially important because of the increasing and deadly misuse of painkilling drugs in the United States. Acupuncture needles are applied on Sarah Taylor's back during an acupuncture treatment at the Children's National Medical Center in Washington, Monday, 2018. 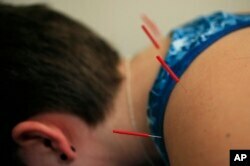 She uses a combination of medications, acupuncture and exercise to ease pain. Dr. Francis Collins is the director of the National Institutes of Health (NIH). His agency is trying to develop what he calls a “pain-o-meter.” The goal is to be able to find out what kind of drug will be most effective for a patient. Now, scientists around the country are using brain studies, pupil reactions and other methods in research supported by the NIH. NIH estimates that 25 million people in the U.S. experience daily pain. Sarah Taylor of Potomac, Maryland, is one of them. She was very young when, her joints started aching. She had bad headaches and swelling of the spine. Then, two years ago, she was found to have fibromyalgia, a condition of pain all over the body. Recently, a researcher worked with Taylor using the pupil-tracking device attached to a smartphone. Dr. Finkel directs pain research at the Sheikh Zayed Institute for Pediatric Surgical Innovation at Children’s National Hospital. She noted that the eye is a window to pain centers in the brain. She said that some nerves send pain signals that affect muscles of the pupils. Finkel’s device follows the pupils’ reactions to light and other stimulation that is not pain. The goal is to find differences that might permit the measurement of the intensity of pain. Finkel also said the presence of some kinds of drugs can be detected by other changes in a resting pupil. In December, the Food and Drug Administration announced it would help a company that Finkel started, called AlgometRx, develop a device to carry out fast drug tests. Other scientists want to look deeper – into the brain. Scientists with Harvard and Massachusetts General Hospital have found that brain images using an MRI can show changes in the brain linked to pain. They suggest that patterns of inflammation in the brain can be linked to fibromyalgia and back pain. Other researchers are studying the brain waves linked to pain and how areas of the brain “light up” with different kinds of pain. The NIH is interested in discovering the biological markers that let some people recover from severe pain while others have long-term pain. Lauran Neergaard reported this story for AP. Mario Ritter adapted it for VOA Learning English. Caty Weaver was the editor.